Bazooka is a formidable weapon, but it can be also used peacefully due to its awesome power. For example, one can use bazookas to break rocks while mining gold. This guy is using his bazooka exactly for this purpose. Will you help him in this flash online game? Then welcome to this free arcade game which will not surely leave you indifferent! This guy is armed and potentially dangerous. But don't be afraid of him – he will never use his bazooka against living creatures. He uses it for other purposes – he's a miner, and his bazooka helps him break rocks and obstacles on his way. 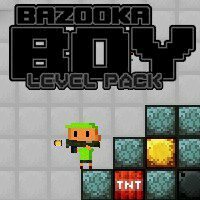 In this flash arcade game your mission is to lead the Bazooka Boy through a big cave and reach all gold nuggets which are hidden behind heavy rocks. Good luck in this game brought to you by ZayPlay!